Web Scraping as a function has been gaining momentum across the globe as an ace process to extract insights from the deep ocean of the internet. While this process is almost indispensable to enterprises wishing to have the edge in their market space, the variety of functionality and services are sufficient to overwhelm a decision-maker. 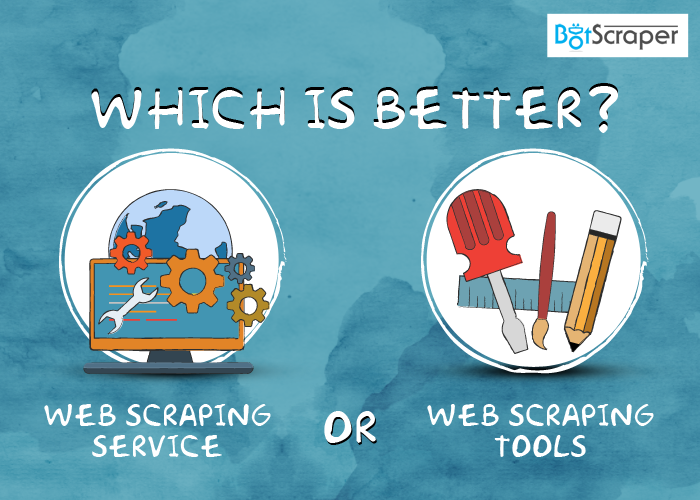 This short piece of information will solve the greatest dilemma an enterprise faces- Are web scraping services better than the tool? While at the face of it, the tool may give you mental gratification as to controlling the process, but reality is far from it. In simple words, the decision is between hiring a tool and having an expert operate it on payroll or to simply designate the task to an enterprise which deals with web scraping day in and day out. Here are a few pointers that should clear some of the fog in your path to an efficient decision. While a web scraping tool may help you fetch data, it is highly unlikely that it is refined enough to suit your business needs. A web scraping tool works on an objective-oriented algorithm which solely extracts whatever data is related to your business. However, availing a web scraping service ensures that the data you receive is not just a dump of raw data, but a consumption-ready file which is refined enough for you to draw analytical insights and frame strategies around. Also, the quality of data received by a tool cannot be vouched for, unlike a web scraping service where you can avail benefits and refining on a customized basis. What’s the use of an ancillary service if its costs are too high to be amortized? Having a tool does not require just the tool but also a trained and dedicated personnel and the right infrastructure which when cumulated will cost you quite a hefty sum. Reason? Simple, your business does not enjoy the benefits of scale. On the other hand, a web scraping service provider has all the right people and resources required to fulfill your requirement and all of it comes at a fraction of what it may cost you. Hence, web scraping services is definitely a cost-effective alternative. Presuming the fact that you still go about with using a web scraping tool, one inevitable fact is that a large amount of man hours would be invested just into refining and cleaning up the massive dump of data to reproduce it into an understandable and usable format. On the flipside, web scraping services come with the base ideology of providing only well processed and refined data. A web scraping service relieves you from all the roadblocks and bottlenecks impeding your growth story. While many do not understand, many websites have extraction policies and frameworks in place to dissuade and prevent any sort of scraping from their website. While your tool may be totally oblivious to the facts, it is you who must face the heat of legal repercussions. A web scraping service provider, on the other hand, will ensure that no policies and legal frameworks are violated during the process and stands to take responsibility for any mishap that may occur due to the extraction process. While the tool would ensue a diversion of some valuable man hours, hiring a web scraping service provider will relieve you of the head-ache and time drain. While the web scraping service provider would be working hard on generating meaningful and insightful data, you get to focus your attention, efforts and resources into more productive avenues. At the end, the growth of your business matters the most. While it is completely a subjective call, the choice is a no-brainer. For an enterprise seeking an efficient, accurate and cost-effective solution to creating a market-edge by leveraging on insightful data, web scraping services beat the tools by a significant margin. If you are now ready with your solution to data scraping and are on the lookout for a reliable web scraping service provider, your hunt ends here with BotScraper.